1. Assistant Librarian - i. A Master's Degree in Library Science / Information Science / Documentation Science or an equivalent professional degree with at least 55% marks (or an equivalent grade in a point scale wherever grading system is followed) and a consistently good academic record with knowledge of computerization of library. ii. Qualifying in the national level test conducted for the purpose by the UGC or any other agency approved by the UGC. iii. NET / SLET / SET essentiality for recruitment to the post of Assistant Librarian which NET / SLET / SET is conducted, for the candidates registered for Ph.D. prior to July 11, 2009 shall be exempted as per ICAR Lr. No.Edn.23/46/2010-EQR(pt) dt. 09.03.2017 subject to the conditions that; a) Ph.D. degree of the candidate awarded in regular mode only; b) Evaluation of the Ph.D. thesis by at least two external examiners; c) Open Ph.D. viva-voce of the candidate had been conducted; d) Candidate has published two research papers from his/her Ph.D. work out of which at least one must be in refereed Journal. e) Candidate has made at least two presentations in conference / seminars, based on his/her Ph.D. work. 2. Assistant Director of Physical Education - i. A Master's Degree in Physical Education or Master's Degree in Sports Science with at least 55% marks (or an equivalent grade in a point scale wherever grading system is followed) with a consistently good academic record. ii. Record of having represented the university / college at the inter-university /inter-collegiate competitions or the State and /or national championships. iii. Qualifying in national level test conducted for the purpose by the UGC or any other agency approved by the UGC. iv. Passed the physical fitness test conducted in accordance with these Regulations. v. NET / SLET / SET essentiality for recruitment to the post of Assistant Director of Physical Education in which NET /SLET / SET is conducted, for the candidates registered for Ph.D. prior to July 11, 2009 shall be exempted as per ICAR Lr. No.Edn.23/46/2010-EQR(pt) dt. 09.03.2017 subject to the conditions that; a) Ph.D. degree of the candidate awarded in regular mode only; b) Evaluation of the Ph.D. thesis by at least two external examiners; c) Open Ph.D. viva-voce of the candidate had been conducted; d) Candidate has published two research papers from his/her Ph.D. work out of which at least one must be in refereed Journal. e) Candidate has made at least two presentations in conference / seminars, based on his/her Ph.D. work. 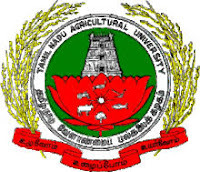 A crossed demand draft for Rs.1000/- (for SC, SCA and ST candidates : Rs.750/-) drawn in favour of "The Comptroller, Tamil Nadu Agricultural University, Coimbatore-641 003" (The demand draft should be drawn from any branch of State Bank of India only payable at TNAU Branch, Coimbatore) should be enclosed along with the application towards Registration Charges. The demand draft should be dated not earlier than 29.05.2018. 6. The candidates are requested to submit applications in triplicate along with attested passport size photograph and certificates. The applications should be filled in the prescribed format shall have to reach the Registrar, Tamil Nadu Agricultural University, Coimbatore - 641 003 before 5.00 pm on 25.06.2018. Defective and incomplete applications and those with wrong or false information will be rejected. The University will not be responsible for the postal delay. The envelopes containing the filled in applications should be superscribed as "Application for the post of Assistant Director of Physical Education/ Assistant Librarian.